Your yard holds a lot of potential. And Cub Cadet’s award-winning zero-turn riders are here to help you unlock it. The zero-turn technology lets you easily mow around obstacles with incredible confidence, making every maneuver more efficient. And with models featuring the innovation of steering wheel control – an advance pioneered by Cub Cadet - you can enjoy increased hillside stability and reduced mowing time. Turn after turn, these zero-turns show their strength in beautiful results. You have a vision for your property. 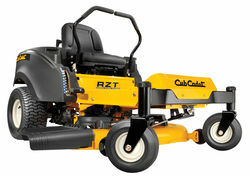 And the XT Enduro Series from Cub Cadet delivers performance that helps you bring it to life. Our lawn tractors are designed to give you unmatched strength and durability with all the comfort and command you need to mow an acre — or several. And, with breakthrough cutting and bagging performance, responsive handling and exceptional versatility, the XT Enduro Series can be ready for any job.